The distinction between the two available 4WD systems is academic for everyday driving. The optional system and the V-8 models' accompanying Dynamic hardware make a difference in extreme situations, on-road and off. The 2015 Land Rover Range Rover Sport takes the last part of its name very seriously, offering the best driving dynamics yet from the famed off-roading brand. Since its launch in the mid-2000s, the Land Rover Range Rover Sport has acted as the shorter, sexier companion to the bigger Rangie. From the very start, its performance has been surprising--but in the early days its cabin was a little too cozy. That changed for the 2014 model year, when the Range Rover Sport adopted the architecture of the latest Range Rover, in the process getting more attractive, more capable, and more efficient all in one fell swoop, while retaining and improving on that SUV-uncharacteristic on-road performance. For 2015, Land Rover takes the Rover Sport to the next level with an all-out performance version dubbed SVR. The company says the SVR is the fastest Land Rover that has ever been sold. The science and engineering devoted to making the second-generation Range Rover Sport lighter and more nimble comes down to one word: aluminum. The Range Rover Sport migrated from its old steel body and chassis to an aluminum unibody like the one on the latest Range Rover. As a result, the Sport dropped about 800 pounds, putting most variants under 5,000 pounds, while picking up scads of drivetrain and handling tech that thrusts it more convincingly into the small set of sporty SUVs that really, truly live up to that confusing duality. In essence the Sport's a slice off the Range Rover, but there's plenty of stylistic influence from the smaller Evoque, especially in its profile. The look is almost pure Range Rover from the doors forward, save for a slimmer nose and winged headlamps. The roofline drops with the drama of the Evoque, with the Sport's styling culminating in an abbreviated tail clearly inspired by the compact ute. The cabin is pure Range Rover, calm and architectural, drawn to play up pure stretches of leather and aluminum, and filtered clean of buttons and switches as much as possible. The Sport's cabin has never looked better, and the latest model's extra room in almost all dimensions solves one of the least happy aspects of the first-generation version, though the second-row seat isn't quite as supportive as the Range Rover's. These are the sacrifices. New features for the 2014 model included so-called "5+2" third-row seating, allowing occasional transport of up to seven people, with full-time seating for five. You won't want to be back there if you can say your ABCs, though, trust us. The split between drivetrains divides the Sport into nicely done and awesomely hot camps, with the 2015 SVR adding a heretofore unthinkable third notch above that. A 340-horsepower, 3.0-liter supercharged V-6 engine is the base engine, delivering a nice 90-degree V-6 snarl and sub-7-second acceleration to 60 mph, in tandem with a sweet paddle-shifted ZF eight-speed automatic. The supercharged V-8 comes from a different planet entirely, one maybe with a timeshare in the American South: In standard form, it barks out 510 horsepower with NASCAR authority, ripping off 5-second runs to 60 mph. And new for 2015, an SVR version of that engine puts out an immense 550 hp and 502 lb-ft of torque that gets fed to upgraded mechanicals. With either of the standard powertrains, the Sport's ride/handling worldview tilts firmly to sport. The bigger Range Rover specializes in coddling while the Sport's air dampers and variable-ratio steering quicken up the pace. The V-8's Dynamic setting dials out much of the innate lean and scrub dictated by its height and weight. It's much closer now to the benchmarks set by the uber-utes from Germany. We expect the SVR will not just lean toward sport but be firmly planted there, with its upgraded chassis, firmer suspension tuning, meaty 21-inch wheels and tires, and myriad other tweaks that are aimed at making it a rocket of an SUV. At the same time, the Range Rover Sport is an incredibly capable muckraker, with either the Torsen four-wheel-drive setup, or the more advanced two-speed four-wheel-drive system, with its active rear locking differential that helps improve traction on pavement and off. The two-speed system is standard on V-8 models and available as an option with the V-6. With more ground clearance than ever, the Sport can extract itself from almost anything the bigger Range Rover can, and its slight size advantage might let it squeeze through where the executive-class Landie might not. Land Rover even designed the SVR to retain its off-road readiness, keeping the same Terrain Response 2 system and low-range-equipped transfer case, but upgrading the computers and hardware in the driveline to better handle the extra power and torque. Five trim lines are available on the 2015 Range Rover Sport: the base SE and upgrade HSE, both outfitted with the supercharged V-6 engine; the Supercharged, with the 510-horsepower supercharged V-8 engine; the Autobiography, which shares the 510-horsepower V-8 but adds a range of unique design elements; and the new range-topping SVR, which gets the 550-hp version of the supercharged V-8 along with plenty of performance-influenced styling and chassis upgrades. All 2015 Range Rover Sport models come nicely equipped, including custom Meridian audio systems (three to choose from, ranging up to 1,700 watts and 23 speakers); advanced safety systems aided by cameras; an 8-inch touchscreen infotainment interface that frankly could use a couple of Palo Alto software geeks and a quick reskin; and of course, the latest generation of Land Rover's Terrain Response 2 traction management system. Changes for 2015 include the addition of the SVR model as well as improvements for all variants. On the infotainment front, Sirius satellite and HD Radio are now standard on all models, and Land Rover's new InControl apps are available as a standalone option or packaged with the Meridian upgrade stereos. A Driver Assistance Pack includes traffic sign recognition, lane-departure warning, automatic parallel and perpendicular parking, parking exit assist, and parking sensors all around the vehicle. The Climate Comfort and Visibility Packages have been reconfigured to add blind-spot monitoring with closing vehicle sensing and reverse traffic detection. And if that's not enough, the puddle-lamp design has been revised to show a silhouette of the vehicle instead of the Range Rover Sport logo. An abbreviated Range Rover more than ever, the Sport's just as charming. Though its appearance borrows heavily from both its larger and smaller siblings—the Range Rover Evoque and needs-no-more-introduction Range Rover—the Range Rover Sport's styling can hardly be deemed derivative or boring. 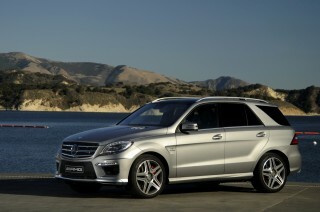 Its clean lines inside and out create a feeling consistent with its sport SUV intentions. Saying there's a strong family resemblance is certainly an understatement. The Sport's roof floats over a glassy greenhouse with blacked-out pillars, just like on its kin, and the details and fillips are kept to a minimum. If anything stands out, it's the fender and hood vents, which are always tasteful and remain noticeable even when they're muted in a darkened "Dynamic" metallic finish. The Sport's nose is slimmer than that of the big Range Rover, and the headlamps are fared into the fenders with a longer winged offshoot that wraps around the front corners. Toward the abbreviated tail, the Sport's wheel arches swell a bit more, and the lower roofline dips faster than on its bigger sibling, like it does on the smaller Evoque. 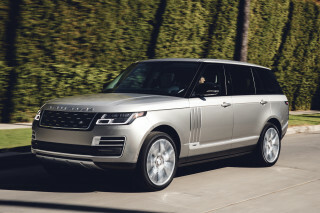 It's tightly drawn, and overall the proportions read a little more classically Range Rover and elegant than do those of its stiletto-styled sibling. The Sport's interior design is squarely in the Range Rover camp as well, pared down to the essentials with large stretches of wood and leather in between. Buttons and switches have been filtered off the dash, with the touchscreen controls picking up the slack, leaving the structural appeal of the design to speak for itself. Even when optioned with extravagant color combinations, the look is both sturdy and serene, a pairing that doesn't always work well. Some visual tricks make the cockpit seem to tuck in around the passengers for a more cozy air, including a higher center console, a smaller-diameter steering wheel, and more seat bolstering. The SVR takes this concept a step further, with an interior that emulates four-place racing buckets with added bolstering, leaving the center rear place for occasional use. The lush detail of the full digital gauges on some models doesn't align with the more dated interface of the touchscreen system in the center console. With any luck, beauty is a firmware upgrade away, and that update arrive will hopefully arrive soon. Ethereal acceleration and muscular grip are part of the Range Rover Sport's deal--but so is impressive off-road prowess. The Range Rover Sport shares nearly all its structure and powertrain components with the bigger Range Rover. As a result, the Sport weighs almost as much as its bigger brother and also performs in a similar manner when it hits knee-deep mud. While both are very capable, this similarity creates a new problem: How do you make the Sport distinctive when the Range Rover is so supple and powerful? The same thorough changes that were applied to the big Range Rover are in force in the Sport. Switching from a steel body-on-frame design to a bonded-and-riveted aluminum unibody has shorn about 800 pounds from the Sport's curb weight between the first and second generations. Curb weights still reach above 4,700 pounds in base form, more than 5,100 all dolled up, or about a hundred pounds less than the bigger Rangie. The magnitude of change pulls some exciting numbers out of the Sport's drivetrains. 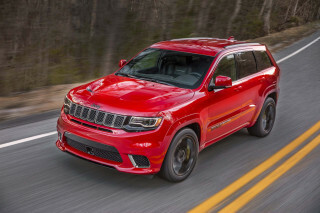 The base 3.0-liter supercharged V-6 is rated at 340 horsepower and 332 pound-feet of torque; it's an assertive-sounding engine at full throttle, with a hearty snarl that subdues quickly as the Sport flicks into higher gears, back into a more relaxed part of the powerband. Trips to 60 mph happen in about 7 seconds, and the top speed is rated at 130 mph with the V-6. If you're really interested in the Sport part of the name, you'll likely opt for the 5.0-liter supercharged V-8 in one of its two states of tune. You may make this choice only for the intake and exhaust riffs that seem inspired by NASCAR stockers. In the Supercharged and Autobiography models, the engine is rated at 510 hp and 461 lb-ft of torque, able to rip off a run to 60 in 5 seconds. This performance puts in in the realm of Cayenne Turbos and Grand Cherokee SRTs. The top speed is 140 mph, but is raised to 155 if the Dynamic pack is specified. The Sport allows manual control of the eight-speed automatic transmission in two ways, either with the stick console shifter--it's not a rotary like the control in the Range Rover and Evoque--or via steering-wheel paddles. When left in auto mode or when you request, the ZF automatic blips the throttle on downshifts for truly sporty and clean gearchanges. It's the new-for-2015 SVR that should really keep the Rover Sport at the top of the extremely-sporty-utility-vehicle heap. 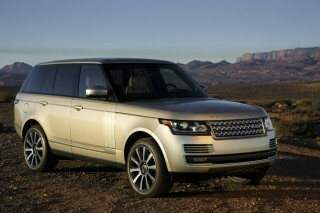 Land Rover has taken the supercharged V-8 and extracted more output, for ratings of 550 hp and 502 lb-ft of torque. The transmission and its controls have been updated for quicker response, the throttle is touchier, torque-vectoring via the brakes is more aggressive, the active locking rear differential is simply more active, and the all-wheel-drive system has 25 programs from which to choose based on sensor readings like gradient, traction, cornering forces, and brake input. To add to the drama, the SVR gets its own two-stage switchable exhaust system that can go from rumbly to uncorked on a moment's notice. In short, nearly every system has been reengineered to better apply power to pavement and live up to the Sport name. It all culminates with a 0-to-60 time of 4.5 seconds and a top speed of 162 mph. That said, the SVR is said to retain the same off-road abilities as its siblings. The basic, lighter-duty four-wheel-drive setup included on V-6 models is a single-speed system with a Torsen limited-slip differential and anti-lock brakes limiting wheelspin. A nominal 42:58 torque split can be overridden to shift up to 62 percent of power to the front, or up to 78 percent to the rear. The more rugged version, standard on the V-8 and available on the V-6, has a low range and locking differentials at the center and rear, with a torque split of 50:50 that can switch to 100 percent, front or rear wheels, as traction dictates. You can choose to let Terrain Response's Auto mode do all of the work or select one of the individual modes (Grass/Gravel/Snow, Mud/Ruts, Sand, or Rock Crawl) to take more command of a particular situation. The Sport's slight size benefit versus the Range Rover isn't so noticeable, but the increased ground clearance over the first-generation edition is. It's normally up to 11.2 inches, and the air suspension can extend itself another inch and some change when it needs to extract itself from especially difficult off-road scenarios. With 21.5 inches of cross-wheel articulation, that doesn't happen too often--but when it does, the Sport can disconnect its roll bars and make the most of its wheel travel. It can even deploy that additional reserve of ground clearance when it's wading close to its 33.5-inch maximum depth, and seconds later, lower itself almost silently down a steep grade thanks to a much quieter hill-descent-control system. The Range Rover Sport is vastly better on pavement than it was in its first lifetime. A laundry list of electronic assistants is tuned for more focus and more grip than in the bigger Range Rover, as well. The Sport uses some of the same air-suspension and electric-steering bits as in the Range Rover, but that flagship's setup is deliberately set for a more relaxed feel. The Sport's most neutral state—when its ride height is set to normal via a console-mounted switch and its Terrain Response system dialed for street driving—yields quicker steering responses with more deliberate counterweight and a much calmer ride than the first-gen Sport. The V-8 Sport goes a few electromechanical steps further to close the gap between its SUV side and its sport-sedan intentions. The Terrain Response system has continuously adjustable dampers and an active anti-lean system. It also tops off the Terrain Response system with a Dynamic mode that speeds up shifts, throttle response, removes most of the slack from the adjustable dampers, and lets the stability-control system take a little bit of a break. There's also an active locking rear differential and simulated torque vectoring that increases its braking input by 15 percent to draw the Sport's cornering lines tighter. All told, the pieces craft a handling personality for the V-8 Sport that's strikingly different from the base Sport, from the Range Rover, and about as deft as the other ultra-powerful SUVs. The second-row seat's just a little less spacious than in the Range Rover. The current Range Rover Sport is growing into its role in the Land Rover family, offering a longer and much more space-efficient package than the first-generation model. Overall length is up 2.5 inches in this generation; at 191 inches long with a 115.1-inch wheelbase, it's just a few inches shy of the previous Range Rover. 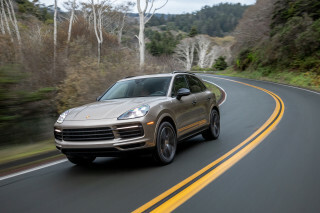 The Sport sits about 2.2 inches lower at the roofline than the Range Rover, and it's about 100 pounds lighter comparably equipped, though its weight rides a little higher than the Range Rover's and its dash and center console are taller, too. Those distinctions are important more for the way the Sport behaves than for the way it coddles passengers, but it's obvious right away that the Sport has learned some lessons in passenger comfort from the Range Rover this time around. Front-seat space is virtually the same between the two big Range Rovers, with scads of head room, while the Sport's adjustable seat bolsters and more snug cushions suit its mission better. Heating is standard and ventilation is available on trims where it's not included. The second-row seats on the Sport don't have the spread-out knee room of the larger Range Rover, and the bottom cushions are shorter, which will leave taller passengers' knees riding high above the seat. The seatbacks recline for great touring comfort, and heating/cooling control is on the features list. There's an inch more knee room than before, though, so contact is only a remote possibility. The second row splits and folds down to extend the Sport's finely finished cargo floor. It's a little thing, but vital to us: the Sport might have the most comfortable door caps of any SUV. The padding is soft, and the height is about perfect for confessed one-hand cruisers to rest an elbow. With each revision of the Range Rover Sport, the impression of quality has increased. The original's plasticky cabin was banished in a refresh a few years ago, while this completely redone Sport's cabin is a subtle knockout, almost indistinguishable from the big Range Rover's. Crash-test scores are still absent, but surround-view cameras and adaptive cruise are on the menu. The 2015 Range Rover Sport hasn't been crash-tested by either the National Highway Traffic Safety Administration (NHTSA) or by the Insurance Institute for Highway Safety (IIHS), likely because of its high cost and low sales volumes. Its score here is based on the usual attributes of SUVs, on its aircraft-style construction methods, and its safety technology. The Sport gets plenty of the latest technology, including lane-departure warnings; blind-spot monitoring; proximity sensors; a surround-camera system; parking assist with help for parking in both parallel and perpendicular spots as well as exiting the space; and automatic high-beam actuation. For 2015, Land Rover adds traffic-sign recognition to the suite of optional safety items and also updates the blind-spot monitors to include closing vehicle sensing and reverse traffic detection. Land Rover's adaptive cruise control system adds more features in the Sport, too. At stop-and-go speeds, the system will bring the Sport to a complete halt, and a tap on the gas will resume cruising speed. All versions come with airbags and stability control, and the Sport's stability system is programmed with lots of subroutines to be run as accident avoidance. There's roll-stability control and trailer-sway control, as well as corner-brake control--all of which apply brakes selectively to neutralize the threat of diminished vehicle control. Hill-start assist and hill-descent control are also standard, as is a rearview camera. Land Rover's flawed infotainment system can't be replaced soon enough, but how can you argue with luxury trim like this? The 2015 Range Rover Sport is available in five different trim levels in the U.S., representing a wide range of power and features. It starts out less expensive than the larger Range Rover but can quickly launch into the larger ute's territory when optioned. 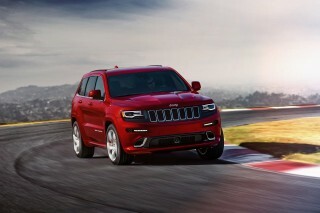 The base SE starts at $63,350 and includes a 3.0-liter supercharged V-6 good for 340 horsepower. Next up is the $68,295 HSE, which uses the same engine but adds features. The $79,995 Supercharged upgrades to a 510-horsepower, 5.0-liter supercharged V-8. That engine is also used on the $92,495 Autobiography, which includes even more equipment and its own distinctive color and trim combination. The $110,475 SVR, the new range-topper, carries a 550-hp version of the S/C V-8 and a host of chassis upgrades to go along with it. All versions come with the usual luxury items, from automatic climate control to power windows, locks, and mirrors; 14-way power front seats with heat; cruise control; leather upholstery; wood trim; 19-inch wheels; a power tailgate; and an AM/FM/CD player as part of an audio system with Meridian-branded components. Three Meridian systems are available, culminating in a 1,700-watt Signature system with 23 speakers. It makes concessions to the similar arrangement in the big-dog Range Rover, which has a total of 29 speakers. Bluetooth connectivity with audio streaming, voice commands, and a USB port are standard. For 2015, Sirius satellite and HD Radio have been made standard on all models. A rear-seat entertainment system with wireless headphones is an option, as is a panoramic sunroof. Wheels can be upgraded to 22-inchers, and off-road tires are available. The audio system, phone, standard navigation system, and other ancillary functions can be controlled on the Range Rover Sport's 8.0-inch dash-mounted touchscreen, which is paired with a 5.0-inch display tucked between the gauges or, on some versions, a full 12.3-inch high-resolution display that replaces the gauges entirely. For 2015, the infotainment setup now includes Land Rover's InControl app suite, which can connect to an Apple or Android smartphone for added functionality. InControl is available as a standalone option or bundled with the upgrade Meridian systems. The options list is more extensive when you consider the Sport's palette of paint colors and leather trims. Options on some versions include a cooler built into the center console; ambient LED lighting with colors to suit any mood; and a package of heating functionality for the windshield, steering wheel, and seats. There's also a +2 seating package, which we discuss more in the Quality section. As long as the list is, there are a couple of features that U.S.-market Range Rover Sport buyers aren't offered that we can't help but wish were made available here. One is a dual-view touchscreen that lets drivers see controls while passengers can watch a movie, allowing front-seat passengers to stay entertained while the driver remains distraction-free. The second is a set of sonar sensors that show how deep a body of water the Sport is fording--when the system detects water deeper than the maximum 33.5-inch rating, it automatically triggers the air suspension's fully extended height. That said, deep-water fording isn't a very common practice for such a luxurious appliance, and most buyers can probably live without it. 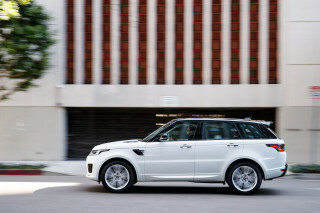 The Range Rover Sport's fuel economy has made big gains in this generation. The 2015 Range Rover Sport gets much better gas mileage than it did in its last iteration, in part due to the huge weight reduction in this generation. 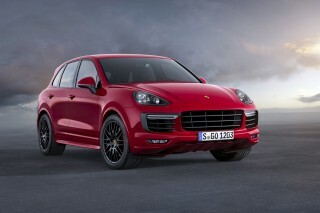 The Sport exceeds the last-generation model's numbers by as much as 30 percent. With its new supercharged V-6, the Sport gets EPA ratings of 17 miles per gallon city, 22 miles per gallon highway, or 19 mpg combined. (The highway number is down one from 23 mpg in the 2014 model, but Land Rover hasn't mentioned any changes to the powertrain otherwise.) Upgrade to the supercharged V-8, and it's rated at 14/19 mpg, or 16 mpg combined. For comparison, the previous-generation Sport's EPA numbers checked in at 13/18 mpg, or 15 mpg combined. Engine stop/start functionality is included on either Sport drivetrain. Plug-in hybrid technology is coming to Land Rover, but since we're not on the short list for the plug-in hybrid diesel coming to the European Range Rover, it's unlikely to make it to our Sport, either. Land Rover has promised a diesel variant, but it won't be available until the 2016 model year. Having come from a 2012 LOADED Mercedes E350, this is quite a change. The mercedes had a ton of options and was a GREAT car. Not one trip to the dealer for repairs, only regular service, but the warranty was... Having come from a 2012 LOADED Mercedes E350, this is quite a change. The mercedes had a ton of options and was a GREAT car. Not one trip to the dealer for repairs, only regular service, but the warranty was out and time to get something new. 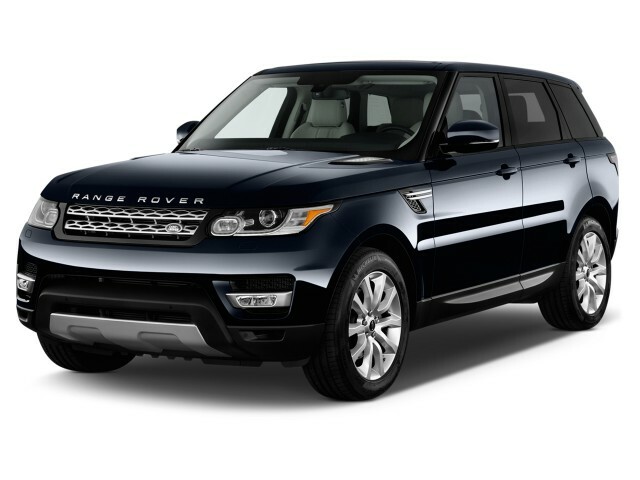 The Ranger Rover Sport has beautiful lines, drives like a well made car and the seats are incredibly comfortable. The climate controlled front and rear seats are a MUST in South Florida. I found the navigation system to be complicated and difficult to use and it could not locate streets that have been around for decades. Very frustrating as a Realtor. Nothing like paying $75k for a truck and using Google Maps to navigate. One other pet peeve is storage. The E350 had tons of nooks and cranies to store stuff. The RR Sport has NOTHING. The console box is also a cooler, but if I load it up with stuff, I can't use the cooler and there is no other place to hide sunglass cases, napkins, pens,cologne etc.. There are empty spaces in the doors that could have easily been converted to storage as well as the trunk area around the wheel wells. Just poor interior design. The Pano Roof is great, climate control is flawless, and the infotainment system is relatively easy to use. Connecting my garage door to Homelink required a call to Homelink who required me to perfrom several steps not mentioned online or in any book in order to get it working.